7 February 2019 – A broadly worded Public Spaces Protection Order (PSPO) criminalising any form of interaction with staff or visitors to a BPAS abortion clinic on Rosslyn Road has been approved by Richmond Council following a Regulatory Committee meeting this evening. A group of mothers who received help outside the clinic have expressed their dismay that yet another council has introduced a censorship zone that prevents vulnerable women from receiving information about help and support available to them. Richmond Council’s Regulatory Committee voted to introduce the PSPO despite grave concerns being raised by Liberty and other organisations about the provisions of the order being too broad and too vague to render it proportionate. The PSPO makes it a criminal offence to make any offer of help to women on Rosslyn Road, and bans “directed” prayer and counselling. 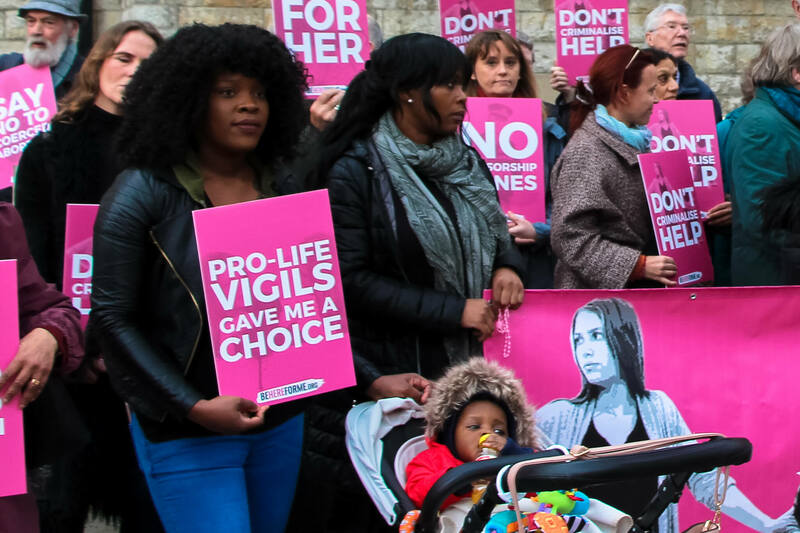 Individuals participating in the pro-life vigil had been accused of “harassing” and “intimidating” women outside of the BPAS clinic, however in correspondence with the Good Counsel Network, Richmond Council could not substantiate the serious allegations made against vigil members. Investigating council officers had only observed peaceful activities such as handing out of leaflets, prayer and the display of placards. In 2014, local police were forced to withdraw a threat to disperse the pro-life vigil using public order legislation in the absence of any evidence. While Richmond sought to further justify the PSPO on the basis of a local consultation result, concerns have already been raised about the framing of the consultation questions, a misinformed understanding of the actions of vigil members, and a decision to exclude over 1,000 responses to the consultation coming from Be Here For Me supporters. The development in Richmond comes only weeks after the Court of Appeal announced that it would be reviewing the PSPO that Ealing Council introduced outside of the Marie Stopes abortion clinic on Mattock Lane. Despite the ongoing challenge and controversy that surrounds the case, Richmond’s new PSPO is worded almost identically to the Ealing PSPO. A crowdfunding appeal to cover the costs of the Ealing legal challenge has raised over £50,000, and Richmond has anticipated that a legal challenge could cost the council around £100,000. Richmond Council previously lost a challenge to a controversial PSPO that would have criminalised local dog walkers if their dogs so much as urinated whilst out on a walk. Last September, The Home Secretary Sajid Javid declined to introduce national ‘buffer zones’ and made clear that there are a wide range of existing powers already available to local authorities and the police to deal with any problematic behaviour outside of abortion clinics. The PSPO shifts the question of criminality to the much vaguer notion of ‘detrimental effect’ and prohibits a broad range of legal and even charitable behaviours. It is important to note that not a single prosecution has been brought against anyone for peacefully offering help in Richmond. The PSPO now awaits final approval of the full council at their next meeting. “I am devastated to hear that Richmond has decided to make it a criminal offence offer help and support to women outside of the BPAS abortion centre in Twickenham. What kind of society criminalises help and limits the choices available to vulnerable women? I met a lady outside of an abortion centre at the most desperate time in my life, when I had no one to turn to for help. All I was offered by the abortion centre was an abortion, and yet these kind strangers gave me the support I needed to continue with my pregnancy. If it wasn’t for the l support that I was given that day, my beautiful daughter would not be here today. “I told the council my story, but they have not listened. I told them that when I met the group outside the abortion centre in Richmond, it was the first time that I felt I had a choice. But now the PSPO means that offering the help I received outside the centre is a crime. “It is shocking to see how Richmond has acted on allegation rather than evidence in bringing in this censorship zone. The astonishingly broad nature of this PSPO shows that they are merely virtue signalling as opposed to protecting women, as they have deliberately chosen to outlaw charitable activity that has a profoundly positive impact for many vulnerable women. Harassment and intimidation is never acceptable outside abortion centres, and thankfully the council and police have wide powers to deal with any problematic behaviour. However, expelling pro-life vigil members at the behest of noisy activist groups in the absence of clear justification is extremely damaging for our society. To arrange a media interview with one of the campaign’s spokespeople, please contact info@behereforme.org or phone 07427018218. High-resolution photos and video of the mothers speaking at the press conference at the launch of the legal challenge are available here and can be used by the media – https://www.flickr.com/photos/153780803@N08/albums https://www.youtube.com/channel/UCVQ1LKpPkJzEyK5xEZ-5iRQ/videos.